Getting into college is a pretty nerve-wracking process, but the requirements are relatively regimented, and most people have a clear sense of what schools they can get into simply based on concrete metrics like the SAT, GPA, and, even, their extracurricular participation. But what about the next step – landing a job? Just like getting into college, there are a number of things you can do as a college graduate that increase the likelihood of your chances at landing a dream job right out of university. However, unless you’re applying to graduate or medical school, chances are that there aren’t as many hard and fast rules, steps, or qualifications that guarantee you a position at a company. Part of the problem is that the job market and academia are completely different ball games. While standardized testing and academic achievement are widely accepted by academic institutions as indicators of your potential as a student, these indicators seem to fall short for companies. Companies are arguably more concerned with your ability to work in a team, deliver results, and contribute reliably to the business. Thus, part of the reason why internships are so important to the job application process lies with the fact that they demonstrate your real-world experience and ability to practically leverage your skills. They’re a barometer for companies to see how you perform in the workplace. I think part of what makes many college students dread applying to internships comes as a result of the feelings of uncertainty associated with the acceptance process. If you look into the core of this trend surrounding the rising importance of internships, you’ll most likely see that it’s a trend that’s bolstered and supported by major companies such as Facebook or eBay themselves, as 70 to 80 percent of new hires at these companies reportedly come from the internship program. Internships have gradually become integrated into the economic fabric and social norms of the recruiting and hiring processes. The developing prevalence of internships is a dream for most companies, they get to have their cake and eat it too with regards to lowering the costs of hiring. Many internships are without pay, the justification being that students are working to prove themselves for the future and gain experience (discounting that there are legal barriers to this based on the benefit the intern provides to a for-profit business). Further, the benefits and compensation provided to interns are usually meager compared to actual employees in the company. Companies essentially get to benefit off cheap or free labor while also lowering the risk of hiring since participating in an internship for a specific company is the best test for both talent and employer regarding compatibility. However, companies aren’t the only ones to benefit. There’s a rather large silver lining for students too. For instance, if you’re able to land an internship at a company you want to work for and you do an amazing job at that company, you’ll have much more confidence in your future prospects, as well as a foot in the door with respect to the necessary workplace connections. The learning curve and adjustment period you’d usually have at a company if you’ve never worked there is also greatly diminished. From the economic or societal standpoint of reducing everyone’s uncertainty and making the hiring process more efficient, internships are a key solution. Check out this chart below to see just how much a difference internships make in hiring. That leads us to the point of this article. Even though participation in an internship spells good news for your post-college prospects and success, the problem of applying and acceptance merely switches hands. This is to say that the problem now becomes how to get an internship. Fortunately, the process of getting the dream internship or a jump on entry into your dream job can be approached and systematically broken down like any other problem, and this article will show you exactly how to do just that. So first things first, before you even begin thinking about internships you’ll want to put a decent amount of time into figuring out the general direction you want to take towards developing your credentials and skills for a future career. A great time to make this assessment is around second semester sophomore year because it falls in line with academic choices and discussions you’ll already be considering. If you go to a regular four-year accredited university in the United States, chances are that you’ll be declaring your major during this time. This means you’ll already be making a significant decision regarding the subject matter you want to study and the fields you want to invest in and dedicate yourself for. There’s no point in looking for internships if you haven’t figured out at least what you want to study and which skills and fields you most enjoy. The worst-case scenario would be applying to an internship in a field you’re on the fence about and then burning out or completely losing passion for it because you weren’t completely sure when you applied. Ideally, it’s best to make a list of fields you’re interested in and then attend introductory meetings or events to get a sense of the types of occupations and expectations in those fields during your freshman year and the first half of your sophomore year. So if you’re thinking about applying to internships, but haven’t already come to a resolute answer about this, take the initiative to educate yourself through events and connections as much as possible. 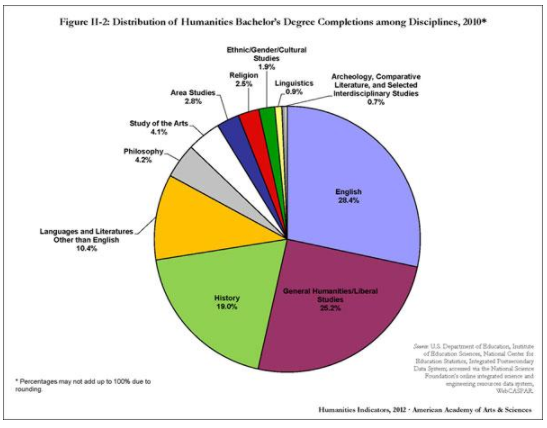 You can also take a look at this list of charts to get an idea of the current trends in awarded Bachelor degrees. Okay. Let’s say you’ve figured out or at least have a general sense of what you think you want to be doing in the future; now that you’re ready to start thinking about internships, you should get acquainted with the types of internships that are available to you. An “internship” actually covers a broad space of unique and specialized training programs, from co-ops to practicums and apprenticeships. So you’ll want to familiarize yourself with your options and then think about which type of “job” best advances and helps you cultivate the necessary workplace experience and skills. Up to this point, we’ve simply oriented and prepared ourselves with being able to make a conscientious and responsible decision in applying to a certain internship. Now, let’s get down to the nitty-gritty of the actual search process. Let’s suppose I’m passionate about the field of chemistry and I’ve decided that I want to pursue a job in industry or research. The most fundamental thing to do is to have a reasonable GPA as well as a relevant and appropriately rigorous course load. Next, you’d want to do a quick Google search for websites that aggregate scientific research and industrial opportunities. 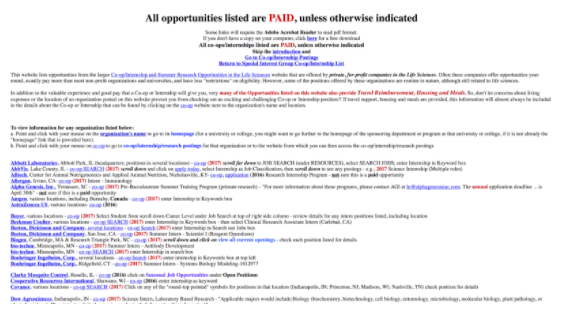 This Rochester Institute of Technology listing or the NIH listings count as great examples of summer opportunities you’d apply for. 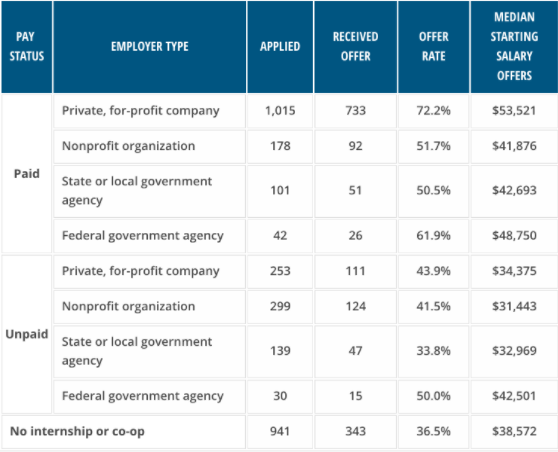 Figure 3: Private company internship listings. Heavy research and pharmaceutical emphasis. From this point, I’d locate a few summer internships that interest me in particular, send a few emails to get additional information on the application requirements and talk it over with a couple of my friends or mentors to narrow down the choices and to get more perspectives on which internships are the most valuable. Two internships at well-known companies or a continued relationship with one company over two years will greatly enhance your employability come senior year. You should keep in mind that getting the best mileage out of the application process still requires you to seek out suggestions, tips, and opportunities from the faculty members or career counselors at your university because they will have more insight into your specific circumstances and needs. This consideration goes hand-in-hand with the process of understanding the nature of the field and the type of internship you intend to pursue. Many internships, especially in industries like entertainment and fashion are non-paid. Meanwhile, internships in the STEM or finance field usually have some sort of compensation in the form of stipends and the like. The large variation in payment really has to do with the norms of the field or industry you’re intending to participate in, so it would be wise to do a bit a research into the details of your particular field. Excluding these differences that manifest across different fields, I think that there seems to be a contentious debate over whether or not non-paid internships are worth pursuing in comparison to paid internships simply based on the likelihood of receiving a job offer. If you refer back to Figure 1, you’ll find that the hiring outcomes of unpaid internships are only marginally better and sometimes even worse than not even participating in an internship. Several news outlets have also published stories calling into question the benefit that unpaid internships afford to students (here and here). Simply based on the statistics and the concerns raised over unpaid internships, I believe that given a choice between an unpaid and paid internship in your field, you should undoubtedly take the paid one, assuming we rule out unique circumstances. Not only do paid internships compensate you with money, they are also seen in the employment market as being more reliable in terms of the skills, experience, and training investment imparted to you by that interning company. Let’s explain this with a straightforward example and field – computer science. 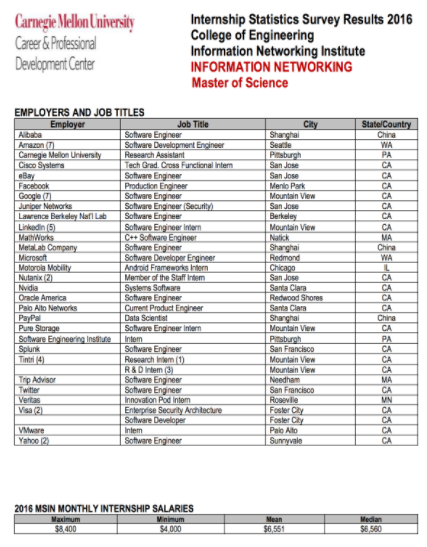 Computer science internships are overwhelmingly paid internship opportunities, so pursuing an unpaid internship would be unfavorable and questionable for the field of computer science due to how it deviates from the expected norm. Again, a key part of this process is understanding and leveraging your college’s specialties and resources to find out what students have done before and what choices are the most promising. Keeping with our example, let’s consider some outcomes from Carnegie Mellon University, which is known for its stellar Computer Science department and education. Figure 4: CMU statistics for computer science internships. Note the average salary and the major companies involved. Finding a similar chart provided online by your college or from a career counselor/advisor will give you an incredible amount of relevant information on the standard payment practices in the fields and the sense of the types of companies recruiting. If I were a student attending Carnegie Mellon, I would keep the mean and range of monthly internship salaries in mind as well as the most prominent companies relevant to the field of computer science to inform my future search, as well as my decision-making and application process to internships. Networking. It’s the last key element of landing that ideal internship because it is what will bring it all together for you. Suppose you’ve developed a clear sense of what you want to do in terms of a career, made a list of potential internships you’d want to apply to, and done a fair amount of work in diagnosing the norms and perceptions around paid and unpaid internships for your particular field or industry. Even with all this work, chances are that whether or not you get your ideal of first-pick, your internship opportunities are still impacted by factors outside of your personal merits. If you’ve meticulously done everything you can to understand yourself, your career, and the academic route you’ll need to take to set yourself up for success, you may still be missing connections. The significance of networking stems from the fact that behind the face of any business or corporation is a composition of people. Hypothetically speaking, if you were somehow very good friends with everyone making hiring and evaluatory decisions at a big company, then you might imagine how smoothly your application to that company will go. Networking follows from the same idea that the more people involved in the hiring process who know you and are friendly with you, the greater your chances will be at landing an internship there. So how can you get started? You’ll want to take advantage of the resources and people closest to you as the first step. Based on the profession you’re attending, your college will definitely host a number of relevant career fair events or more specialized opportunities to meet with local recruiters or industry professionals. You’ll also want to spend a fair amount of time reaching out to professors and other faculty that you think or know might have some prior experience in the field you’re interested in. At many universities, faculty are often pursuing fascinating research projects of their own, in addition to leading lectures. If you’re already focusing on or interested in one of the natural sciences, lectures or office hours are a great opportunity to express that interest to your professor and perhaps find opportunities tangential to their research. Simply being present and having conversations with the right people in your university will already significantly broaden your choices and confidence in securing a great internship opportunity. Another powerful tool you need to take advantage of is LinkedIn. You can market your skill set, expertise, and experience and also define your career interests through this convenient platform. All of the work you’ve put into your academics and extracurriculars can be displayed for potential employers to see. More importantly, however, a key feature of LinkedIn is that it tracks professional connections. Suppose you want to get in touch with the CEO of a startup but you have no direct relationship to that person. With LinkedIn, you can research and trace the connections you have with other people to see how many degrees of separation you have with that CEO. Suppose there’s three degrees of separation between you and someone else. The true utility of LinkedIn is that you’ll be able to contact the people you know to help introduce you to one of their professional contacts, and then repeat and rinse that process until you’re introduced to the person that heads the internship process or the company you’re applying for. It’s a potent way to get your foot in the door and make a good impression provided you play your cards right. At the end of the day, ensuring your chances of landing an internship really involves a great deal of common sense when you break it down into smaller problems to solve and take a structured approach to solving those problems. You’ll start by asking yourself what career choices are right for you and then proceed to invest in training the skills required for that career and field to competency. After you’ve established a keen sense of the hiring situation and expectations within your desired field, you should work on excelling academically and seeking out minor extracurricular opportunities to help you sharpen additional skillsets. Along the way, you should aim to establish a good relationship with professors, as this may help you seek out job opportunities during the semester. Finally, you can expand your network and reach out to key people involved in the application process through the use of LinkedIn to drastically boost your chances. Recognizing that landing an internship is supposed to be a long process that heavily relates to your future and career will help you to orient yourself towards creating a successful application.